Compound events can be classified as independent, dependent, or mutually exclusive events. When the outcome of one event does not influence the outcome of a second event, we say that these are independent events. If two events A and B, are independent, then the probability of both events occurring is the product of the probability of A and the probability of B. A bag contains 6 black marbles, 8 white marbles, 4 yellow marbles, and 2 green marbles. A marble is selected, replaced, and a second marble is selected. Find the probability of selecting a black marble, then a yellow marble. When the outcome of one event affects the outcome of a second event, the events are dependent. If two events, A and B, are dependent, then the probability of both events occurring is the product of A and the probability of B after A occurs. Mike randomly draws three cards from a standard deck one at a time without replacement. 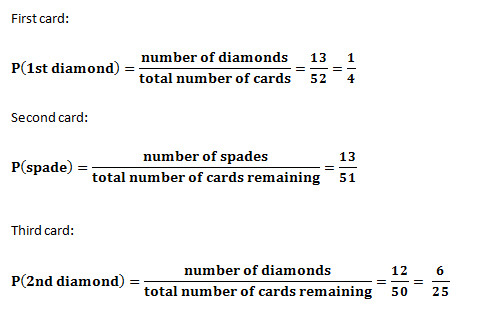 Find the probability that the cards are drawn in this order: diamond, spade, diamond. When two events cannot happen at the same time, they are mutually exclusive. If two events, A and B, are mutually exclusive, then the probability that either A and B occurs is the sum of their probabilities. A die is being rolled. Find the probability that it shows 3 or 5. Since a die cannot show both a 3 and a 5 at the same time, these events are mutually exclusive. The probability of rolling a 3 or a 5 is 1/3 or about 33%. Selecting a marble and then choosing a second marble without replacing the first marble. A box contains a nickel, a penny, and a dime. Choosing first a dime and then, without replacing the dime, choosing a penny. A. Dependent Events. The total number of marbles is decreased or changed when the first event of selecting a marble is done. B. Independent Events. The two events can happen at the same. A. Dependent Events. The first event affects the probability of the second event by changing the total number of coins contained in the box. A weather forecaster says that there is a 25% chance of rain today and a 55% chance of rain tomorrow. Each week you have a surprise quiz in your social studies and science classes. Find the probability that both quizzes will be given on the same day next week. Twelve light bulbs are tested to see if they last as long as the manufacturer claims they do. Three light bulbs fail the test. Two light bulbs are selected at random without replacement. Find the probability that both light bulbs failed the test. From the previous problem, find the probability that both light bulbs passed the test. The probability that Tara will make a free throw is ¾. What is the probability that Tara will make her next two free throws? A printing company’s bookbinding machine has a probability of 0.5% of producing a defective book. If this machine is used to bind 3 books, find the probability that none of the books are defective.